Are you considering getting dentures and wondering how on Earth you’re supposed to keep them clean? Maybe you already own dentures and you’re wondering what the best denture cleaners are? Quite often, many people are surprised to learn that even though their dentures are made out of fake teeth and gums, it’s still entirely possible for bacteria and plaque to build up on them! This harmful build-up can then in turn damage your existing teeth and gum line. So with that in mind, you can see that it’s essential to clean your dentures on a daily basis, just as you would your real teeth. Not to worry, when it comes to keeping your dentures clean, I’ve got you covered with this helpful guide. There’s a lot of options out there for denture cleaners and not all of them are made equally. My aim is to help you separate the duds from the cleaners that will have your dentures shining. 1.2 Should I Get Some Dentures? 1.3 What Are Dentures Made Out Of? For brevity, here is a quick summary of the denture cleaners we’ve reviewed below. If you already own a pair of dentures, it’s probably safe for you to skip directly to the cleaning sections of this guide. However, if you’re planning on getting dentures and you’re still in the early research stages, then read on. Should I Get Some Dentures? Do you feel self-conscious when you smile because of a few missing teeth? Maybe your oral health care was a little lacking before, resulting in rotted roots or serious damage? Perhaps you’ve decided that now is the time to tackle some long standing teeth or gum issues? Dentures can address all of the above issues and more. They can help give you a nice smile that is full of teeth again, and they are a viable replacement for any teeth you may have lost due to poor oral hygiene or for whatever other reason. A complete set of dentures was traditionally made of a gum colored acrylic base for the gums and plastic or porcelain teeth. However, there are now also more modern forms of dentures available that are made differently. It’s important to note that the material used to make the replacement teeth in dentures is not as tough or durable as your real teeth. They are more prone to chipping or cracking so you should take the utmost care with them when cleaning them or whenever you have them out. They also tend to wear down naturally and must be replaced every five years on average. As I mentioned earlier, it’s essential that you clean your dentures on a daily basis just as you would your real teeth. This is to prevent tartar and plaque from building up on them, which can in turn cause infections elsewhere through your mouth. In order to properly clean your dentures, you should first run water over them to clear away any loose food particles that may be lodged in them. Next, you’ll be using a toothbrush to clean both the teeth and gum part of the dentures. Be sure not to use regular toothpaste for this cleaning however — it can be too abrasive and can actually damage the denture material. Instead, clean your dentures with either a mild soap, or preferably, a dedicated denture cleaning solution. After cleaning them like this, give your dentures a quick rinse as well. Alternatively, there’s also denture cleaner mixes out there that you simply soak your dentures in to give them a thorough cleaning. And speaking of dedicated denture cleaning solutions, it’s time we took a look at the five best denture cleaners available to help you decide which is the right one for you. As you can probably imagine, there’s quite a few options out there for denture cleaners. To save you the trouble, we’ve looked into the vast majority of them and narrowed it down to a list of five of the absolute best denture cleaners available. All five of these products can be purchased from the comfort of your own home directly through Amazon. 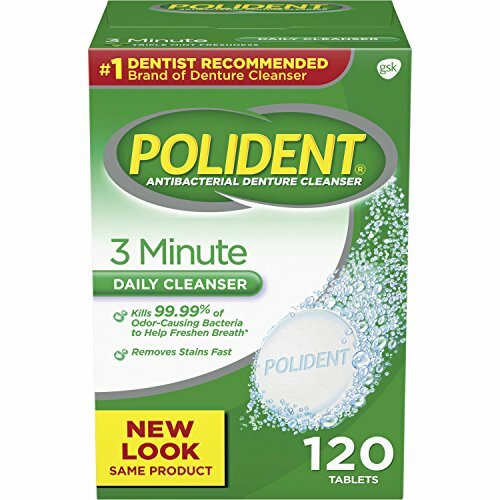 The first denture cleaner that I would recommend is this offering from Polident. Their overnight whitening solution is designed to kill 99.99% of odor causing bacteria and works to deep clean any stains present on your dentures. All you have to do is drop one single tablet into enough warm water to completely cover your dentures, and then leave it soak overnight. After the soak, brush the denture with the solution left in the glass using a soft brush and then rinse it off. 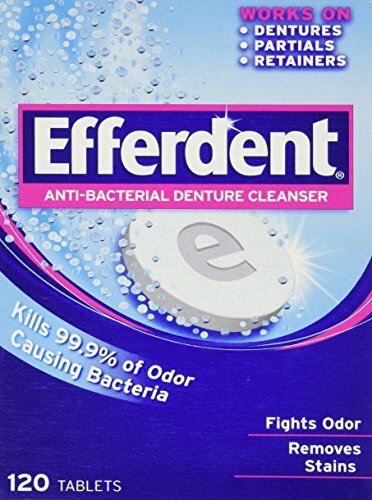 Next up on our list is this antibacterial denture cleanser produced by Efferdent. It works in the exact same way, you simply leave your dentures soak in the cleaning solution and then brush and rinse them afterwards. It’s also capable of killing 99.99% of odor causing bacteria and deep cleans your dentures with powerful effervescent cleaning action. The solution is effective for not only full and partial dentures, but it also works great for cleaning retainers as well. This product is also excellent for fighting plaque buildup on your dentures. As with the Polident cleaners above, Efferdent also makes a variety of different cleaning products to suit your specific needs. The third entry for the best denture cleaner is the Stain-Away Plus Denture Cleanser made by Regent Labs. This cleaning solution will whiten and brighten your dentures effectively, making them look just like new. It takes only five minutes to effectively clean your dentures with the flavor particles. Regent Labs also claims that this denture cleaner has more than three times the strength of tablet options. However, they also recommend that you use this product for full dentures only. This mixture can either be used to soak your dentures for 10-15 minutes or overnight depending on your needs, as the cleaning powder will work all night long providing powerful cleaning action. Next up on our list we will be taking a look at Equate’s Antibacterial Denture Cleanser. Equate is actually a brand produced by retail giant Walmart that offers low cost alternatives for many popular items. Don’t let that put you off however — even though the products are low cost they are still made with an incredibly high quality. 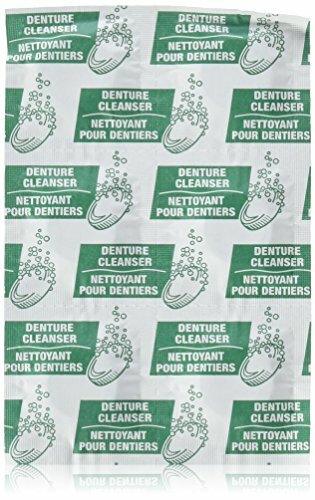 This denture cleaning product is no exception. As with the other products on our list, this cleanser kills off the bad bacteria that causes odor and helps to keep your dentures nice and bright. 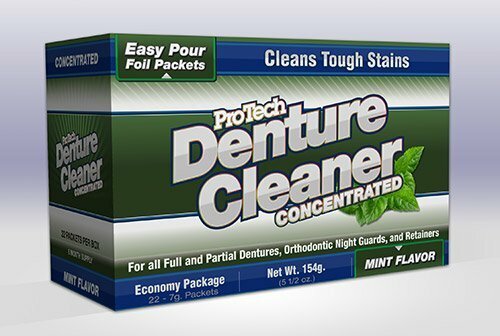 The final denture cleaning product that I highly recommend is ProTech Concentrated Denture Cleaner. This economy package includes 22 pre-measured mint flavored foil packets of cleaning solution, with each packet lasting between 7-10 days. Be sure to keep the glass containing your solution mixture somewhere safe to use again! Their cleaning solution is marketed as professional strength and it is similar to the kind that you would find in dental offices, helping to dissolve plaque buildup while disinfecting your dentures. It’s excellent for dentures, partials, retainers, and orthodontic nightguards. Safe for all types of dentures including soft relines, partial dentures, and orthodontic appliances — although it is not recommended for use on partial dentures fabricated from Ticonium Alloy. So now that we have covered the five best denture cleaners available, some of you may be wondering what the unanimous top selection would be. First off, I have to say that you genuinely can’t go wrong with any of these denture cleaning products. The only exception to that would be if you have partial dentures, in which case the Stain-Away Plus cleaner wouldn’t be recommended for your usage. Otherwise, if I had to choose one of these cleaners to recommend over the others, it would definitely be the ProTech Concentrated Denture Cleaner. Sure, it’s only available online and it’s slightly more expensive than the other options. However, I do most of my shopping online anyway so it’s not really a con for me and as far as the price goes, you are definitely getting a top notch quality denture cleaner for the price tag. It tastes great, it’s professional strength, and with each packet lasting for a week on average — it all adds up to one fantastic product that I can’t recommend enough for anyone. We sincerely hope you enjoyed this guide and that it helped you figure out what is the best denture cleaner for you. Feel free to leave a comment below to let us know how any of these cleaners work out for you and please do share this article with your family and friends if you feel that they might find it helpful!